When your airplant get a flower, it’s in his final phase. You can extend the life of the airplant to take the flower out. 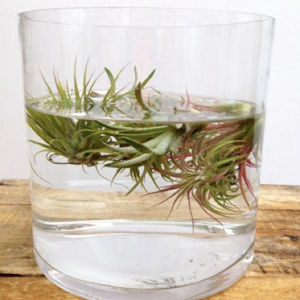 Basically the same care as discussed above, applies to airplants in an open glass. 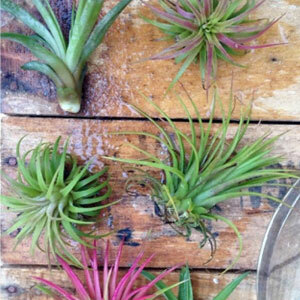 However, it is very much recommended to get the airplant out of the glass once you spray it. Also, the advice is to let the airplant dry off completely before putting it in the glass again. Spraying with the Take Airplants care spray is preferred, whereas it is also possible with water (natural water is better than hard water/water from the tap). 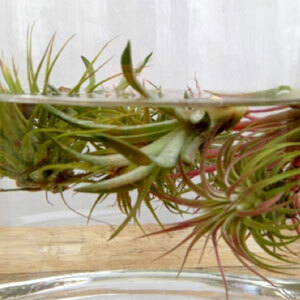 To further improve the health of your airplants, the monthly soaking method can also be applied here of which the details are discussed at the bottom of this page. Important is to always let your airplant dry off completely before putting it back in the glass. Normaly an airplant in closed environment/closed glass don’t need water. The airplant can live from the humidity. You only need to keep a good eye on the appearance of the airplant. Whenever you see that it’s losing his healthy, we recommend you to apply the soaking method. This method is discussed in detail at the bottom of this page. The most important thing after soaking, is to let the airplant dry off completely in an open environment with good air circulation and bright light (no direct sunlight). After the soaking method, you’ll find your airplant getting its strong and healthy look again, after which it could be put back into the glass. Whenever you see the same deteriorating process happen again, the process can be repeated.